A super-pseudobulb-sized tetraploid (4N) form of the delightfully fragrant Maxillaria tenuifolia ! Native to Mexico, Honduras, Guatemala, Nicaragua and Costa Rica, this species’ creeping rhizomes grow slightly vertical, producing oval pseudobulbs and multitudes of irresistible coconut-fragrance flowers. 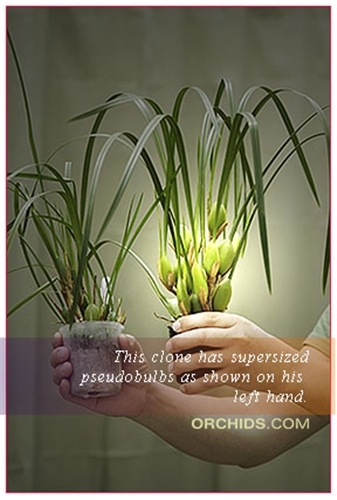 Grown to specimen size, it can produce hundreds of flowers on a compact plant. Easily grown indoors or outdoors in frost-free areas. Highly Recommended !